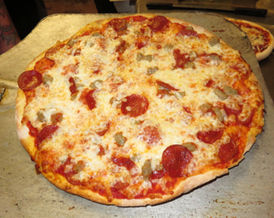 All pizza specials are prepared on regular hand tossed crust. Kids eat FREE! - Get one FREE kids meal with every adult meal. 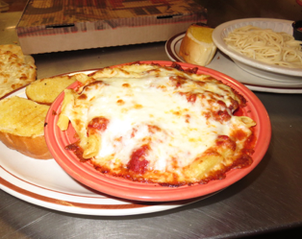 Dine in special – Baked pasta for 2! Daily lunch specials served Monday through Friday only. Includes a cup of "soup of the day" or cup of chili. Salad includes crisp lettuce, black olives, tomatoes, cheese and croutons. With your choice of one of our homemade dressings. Full order of spaghetti and two pieces of garlic bread. Combination of mixed greens, turkey, mushrooms, tomatoes, black and green olives, onions, green peppers, topped with homemade garlic croutons, and Italian cheeses. Served with one slice of grilled garlic bread.